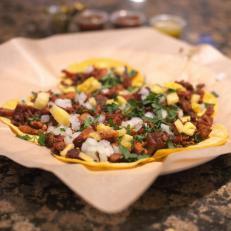 Though there are plenty of other great taco options within a few blocks, it’s worth keeping an eye out for this one. Hang a hard right into the driveway and you'll be rewarded with a plate of tiny pork tacos sliced from a spit just like you'd find on a Mexican street corner. The default dressing is onions and cilantro, but be sure to ask for pineapple. It's a must for cutting through the exceptionally spicy salsas and warm roasted peppers in a slow cooker by the counter.